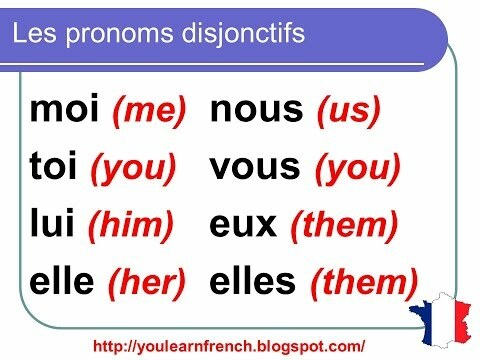 Just as in English we have 'they' and 'them' (but note, only 'you'), French uses these so-called plural Stress Pronouns. Note that most are the same as the Subject pronouns, with the exception of eux. Vous aimez le vin alors qu'elles , elles détestent ça ! You like wine whereas they hate that! Tu vas chez Lisa pendant que nous, nous nettoyons la maison. You go to Lisa's place while we clean the house. Je vais à la poste, et eux, ils vont au supermarché. I'm going to the post office, and THEY are going to the supermarket. Note that in English, you would use intonation to mark emphasis. Qui veut du gâteau ? - Nous ! Who wants cake? - Us! Et ces filles? - Elles? Oh non! What about those girls? - Them? Oh no! Eux is used whenever the group is masculine or mixed. Only use elles when all members of the group are female. NOTE: With eux and elles, technically you should say Ce sont... for it is but you will hear people use c'est. Use ce sont in writing, but you can use c'est in speech.